Great weather we have been having. Best of all, looks like we have more in store, at least, until next weekend. Right now, the forecast is for temperatures in the mid to upper 70s through Wednesday. Then, a couple days in the low 80s, and back into the 70s for the weekend, with slight chances for showers. Taney has been pretty consistent with no generation in the a.m. and 3-4 hours in the afternoon starting around 2:00 p.m. The exception was last Thursday when they ran water all day. And, again today, they are running a low one unit. Projection for tomorrow is back to no generation in the a.m. and something in the afternoon. Boats on the water almost every day this past week. Last weekend, we hosted another Orvis 301 clinic which was sponsored by the Orvis store in Leawood, Kansas. Great couple of days of learning and catching experience for everyone. Both Saturday and Sunday, everyone caught lots of fish on almost everything we threw at them: black/copperhead midge, black/silverhead midge, #12 olive wooly bugger, CQ streamer, soft hackles, P&P midge. ruby midge….we tried them all. 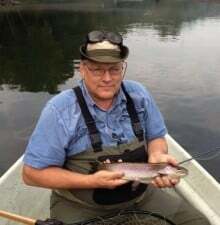 Best fish for the weekend was an 18 inch rainbow caught by Phl. I think he was from north of Kansas City near the race track. In the midst of all our 301 clinic chaos, Dana had Thomas and Jim, from Tennessee, on the water for the day. Good day for these guys on the rusty midge, a peach egg pattern and a #16 chartreuse egg pattern. Monday, Gina took Donna, from Oklahoma out for half a day. 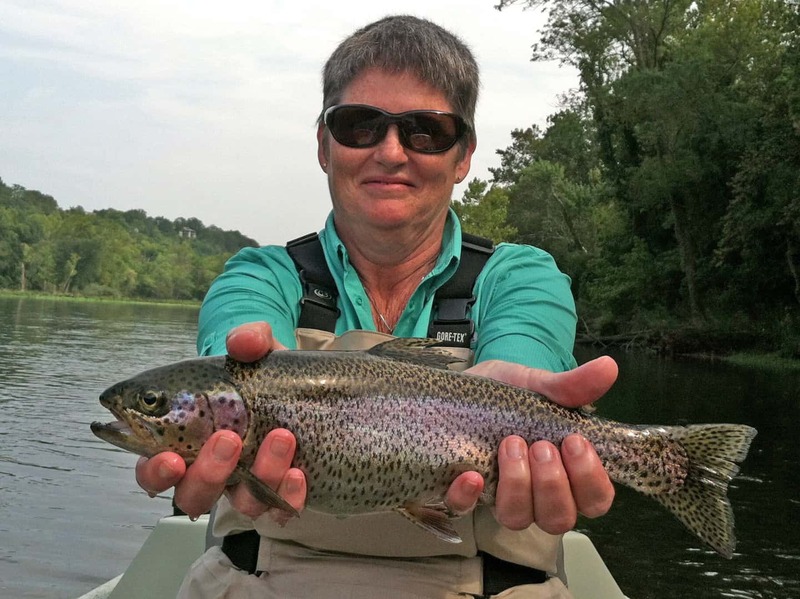 Donna is a fly fishing lady, but had never been in a drift boat. Good day for Donna on the #12 olive bugger and the CQ streamer. Carolyn was taking Pam and Joe, from Texas, through the first day of a two-day fly fishing school. This was the classroom in the morning and casting in the afternoon day. Tuesday, it was to the water for Pam and Joe. We did manage to get into a few fish on Tuesday, but it was tough. Probably one of the tougher days I’ve seen for quite a while. But, they pulled streamers, midged and even worked soft hackle a little. Stan took Wayne and Robert, from Kansas out on Wednesday. They had a great day on the copper dun midge. Both Wednesday and Thursday, Jim had Wayne and Colleen, from Hawaii out all day. Good days for these guys. Probably did better Thursday and Wednesday on the red midge, black midge and a size 8 CQ streamer. Thursday, Tom and Marge, from California spent half a day on the water with Carolyn. These two have been fishing with us since 2004 and are a hoot to fish with. Tom was celebrating his 79th birthday. Happy Birthday Tom! Stan had Luanne and Glenn from here in Missouri out for half a day. Luanne is the fly fisher in the family, but Glenn is beginning to like it also. They had a good day on the copper dun midge. Luanne wanted to learn the stripping technique, so Stan fixed her up with the sinking leader and a holographic green crackleback and they also caught fish on this. This entry was posted on Sunday, September 22nd, 2013 at 2:33 pm	and is filed under Fishing Reports. You can follow any responses to this entry through the RSS 2.0 feed. You can leave a response, or trackback from your own site.